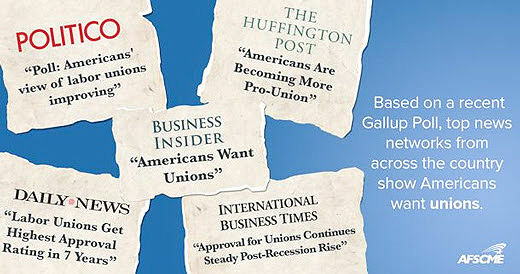 Gallup poll: "Americans want unions"
Americans are seeing the connection between unions and balancing the economy, allowing workers to come together to build a better life for their families. Six out of every 10 Americans now supports labor unions – a phenomenal five-point jump over the previous year. That’s the latest from a Gallup poll released this week showing that during the past year, Americans’ approval of unions skyrocketed to its highest point in seven years. That swelling support is spurred by unions like ours doubling down on their organizing efforts, having one-on-one conversations with working people across the country about the value of a union. Our union’s AFSCME Strong campaign thus far has organized more than 185,000 new members in the past year. Even employees at non-traditional workplaces are getting in on the action, seeing how unions bring a voice on the job, improve incomes, and help achieve real work-life balance, making it possible to say, take a day off if a child falls ill. In recent months, the staffs at digital media sites like Gawker and Slate voted to unionize. 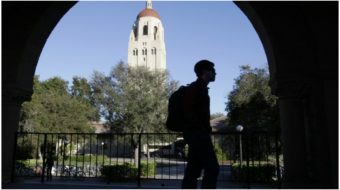 That the staffs at those two unions tend to be younger and supportive of unions follows suit with Gallup’s findings. According to the poll, those ages 18-34 are most supportive of labor unions. A whopping 66 percent of this group views labor unions favorably. It’s a trend demonstrated in other recent polling, such as a survey conducted by the Pew Research Center. Support for labor unions grew among various groups in recent years, including millennials who are politically conservative, and women, whose approval of labor unions is 63 percent – spurred in part by the understanding that collective bargaining is the best way to close the gender pay gap. Learn more about how a strong labor movement can improve the middle class and how the momentum in favor of strong unions is catching the public eye. The above story was sent to us by the American Federation of State, County and Municipal Employees.